Deja Fambro, an Aviation Management major, is the first MGA student to embark on a semester at sea study abroad experience, which will take her to 11 countries between now and late December. Full Name: Deja Shimone Fambro. Family: Mother, Regina Fambro; father, Ronald Walker; friends, Kevin Coleman and Jason Morrison; instructor, Margret Bell; Residence Life coordinator, Evyyone Tapper. Degree Objective: Bachelor of Science in Aviation and Aerospace Management. Activities: Model African Union, Anderson Hall resident assistant. Career Goals: "I would like to become a private pilot because I have a passion for aviation and travel. I have a dream of traveling to all seven continents." 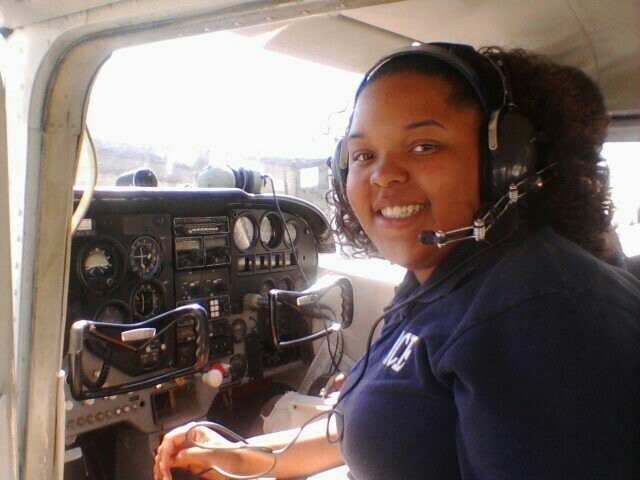 She chose Middle Georgia State University because … "It has an amazing aviation program located on the Eastman Campus." The greatest thing she discovered about Middle Georgia State was … "The faculty and staff. People like Ms.Bell have gone over and beyond to help me. She wrote a recommendation letter for me when I applied to be part of the Semester at Sea program. My math instructor, Ms. Gray, has stayed after class numerous times to work with me. (Math is my weakest subject.)" Her greatest academic experience so far as a Middle Georgia State student has been … "Going to Washington, D.C., to compete in the Model African Union with Georgia Academy students. While competing I learned more about Mother Africa. We debated current events taking place throughout the country and learned about the different cultures, languages, and people that make up the continent of Africa. This was a great learning experience to prepare me for actually traveling to Africa as part of the Semester at Sea voyage. "The Semester at Sea is through the Institute of Shipboard Education and will take me to 11 countries between now and late December. It might seem odd that an aviation major wants to spend a semester on a ship, but I thought it was a unique program. This will give me the opportunity to travel to some of the countries that I hope to eventually be flying into and out of." To her, 'greatness' means … "Persevering in the face of adversity. Throughout my life I have been faced with adversity and challenges that could have kept me from reaching my dreams and goals. I figured out that no matter the obstacle or challenge, resilience is key. I knew that as long as I continued to work hard and keep a positive attitude I could overcome anything that stood in my way." In five years … "I see myself working towards gaining my commercial flight ratings and working in management at an airport. I hope to be well on the way of reaching my goal of traveling to all seven continents. I'd also like to get involved in a non-profit organization that encourages young women to join the aviation industry."